Blast out blackheads with benzoyl peroxide. A closer look in the mirror reveals that those charming, tiny freckles are actually blackheads. The bad news is, well, they’re blackheads -- the good news is that you can get rid them. If your T-zone is starting to look more like the coat of a well-bred Dalmatian than a wash of peaches and cream, it’s time give your pores a deep cleansing. 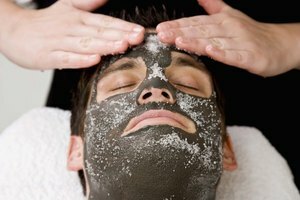 But before you pull out the sandblaster, try some gentler daily techniques that are sure to get your face squeaky clean. 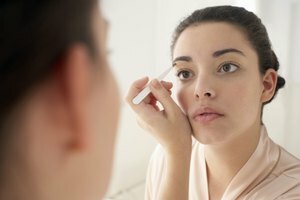 Wet your face with warm water and massage a face wash that contains benzoyl peroxide over your face using circular motions. Concentrate on any areas where blackheads exist. For added oomph, use a facial brush to gently deep clean pores as you wash. Benzoyl peroxide is a mild acid that breaks apart the waxy material inside blackheads and removes it from the skin. Wash your face with this product twice per day. Apply an acne-blemish cream containing benzoyl peroxide once per day. It’s best to apply it at night, as it will stay on the skin longer. Wet the back of a pore strip or wet your actual skin, depending on the brand. Position the pore strip over the blackheads and press it firmly onto the skin. Allow the strip to dry completely and then gently pull it off the skin. The blackhead material will stick to the strip as you pull it off. Discard the used pore strip. Spread an oil-absorbing mask made of clay over your face in a light layer using your fingers. Allow the mask to dry and then rinse it off with warm water. You can also choose to apply the mask only to the blackhead-prone areas instead of your entire face. Reapply the mask once per week. If the blackheads don’t diminish, or if they recur frequently, schedule an appointment with a dermatologist who can prescribe stronger treatment methods. If your skin turns red or begins to dry out, switch to a face wash that contains salicylic acid instead of benzoyl peroxide. Salicylic acid takes longer to work, but is gentler on the skin. Do not squeeze blackheads to remove them. Doing so can lead to skin inflammation and infection. Johnson, Kimberly. "Everyday Routines to Get Rid of Blackheads." Synonym, https://classroom.synonym.com/everyday-routines-rid-blackheads-12680.html. Accessed 20 April 2019.